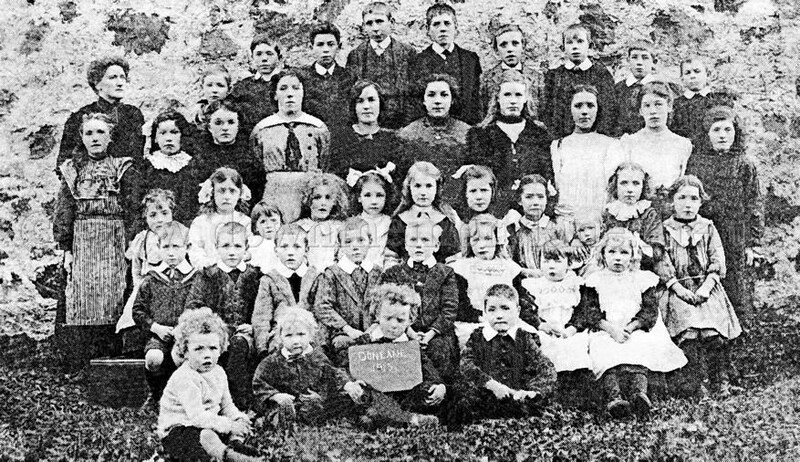 These are the pupils of Duneane Primary School having the annual school photograph taken back in 1913 and one year later the country would be at War. At the back from the left are Hammy Bell, George Warden, William Stewart, William McMillan, Johnny Doole, James Stewart, Adam Gilbert, Johnny Percy and Alex Bell. 2nd row has teacher Miss Millan, Lizzie Doole, Aggie Stewart, Essie Doole, Ethel Stewart, Dora Dale, Meta Stewart, Lizzie Gilbert, Lizzie Wolfedan, Mima Gilbert and Tilly Doole. In the 3rd row are Mary Doole, Doreen Elliot, Doreen Stewart, Lelia Elliott, Maggie Stewart, Eva Warden, Agnes McMillan, Emma Wolfeden, Maud Wolfeden with baby brother Sam Wolfeden in her arms and Agnes Woldeden. Seated are David Perry, Henry Stewart, Fred Stewart, Adam Stewart, Cauldwell Gillespie, Jean Gilbert, Susan Gilbert and Dorothy Gilbert. On the ground in front are Robin Elliott, David Wolfeden, George Wolfeden and William Doole. When you look at the names it makes me wonder how the mothers coped back then for one mother has 8 in the class!